Christine Lavin : JINGLES EMERGES FROM HIBERNATION! 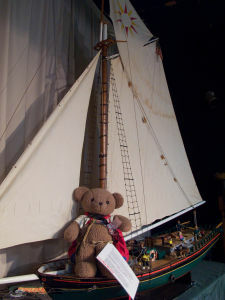 JINGLES CAUGHT TRYING TO SNEAK ONBOARD THE "CLEARWATER" -- quick-thinking audience member snaps historic photo! WAY BACK LAST CENTURY . . . in June 1995, Jingles the teddy bear started traveling and collecting jokes for children. He's been on vacation for awhile, but HE'S BACK! On April 11th he came to my concert at the Clearwater Walkabout, and audience member Jon Marsh snapped his photo trying to stowaway on the replica of the Clearwater which was onstage. Obviously, Jingles' plan was thwarted -- not only was he photographed sneaking onboard, he didn't realize the Clearwater was in drydock and that he was too big to fit in the lifeboat he planned to hide in! p.s. If you want to add jokes to Jingles' book but won't be at a show, add a joke here!